this is your first photo. ever. you're that vertical white smudge beneath my middle finger. since i'm just about 7 weeks along, you're supposedly the size of a blueberry. i'm guessing sonograms exaggerate your girth. today i saw your heartbeat. i saw your little image, your smudge, flicker on the sonogram monitor. your heart beats healthily, according to my doctor. i'm SO relieved, and so very thankful to know that you're growing and progressing well. i'll still be having blood drawn ever week so the doctor can continue to monitor my hormone levels, but those seem to be improving as well. doc said he was very impressed by the rise in my pregnancy hormone, and starting a regimen of supplements should help my progesterone levels to rise as well. things seem to be back on track, and i'm so excited! things seem much more real now, baby. 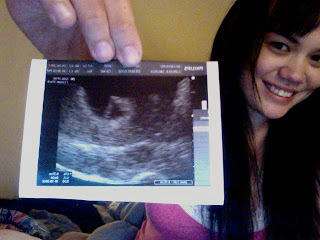 you exist in my tummy and i have photographic evidence! seeing your heart beating was one of the most profound moments of my life. please know, baby, that you are already SO loved.